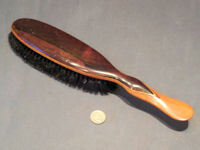 Original, quality 1920's gentlemen's clothes brush in super condition with a birch mount for the handle and bristles and a rosewood top veneer. The grip is impressed "Pure Bristle," a beauty and complete and in good and working order. 12.5" x 2.5" and 1.75" front to back including bristles. 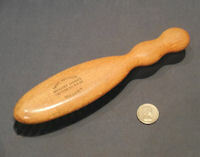 Original, quality pre-war, clothes or upholstery brush with a shaped beech handgrip, backing and bristles. The top is detailed in black upper cased text "Happy Motoring, Ancaster Garages, Croydon Rd, SE20" (London) and with the telephone number "SYD4415/6". Complete and in good and order. 8" x 1.75" and 1.5" tall. 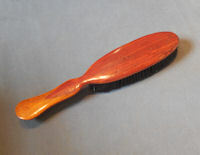 Original, quality 1920's, superb gentleman's clothes brush in pale birch with a rosewood upper layer and black bristles. The handle is well shaped for comfort and the back of the brush has a short bristle section. Once you have used one of these brushes you will always want one. Complete and in good order. 12.5" x 2.5" and 2.5" front to back. 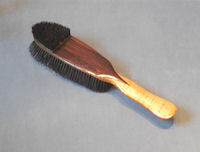 Original, quality 1920's, gents clothes brush with a fruitwood body, a shaped hand grip and dark bristles. Complete and in good and usable order. 12" x 2.5" and 1.25". 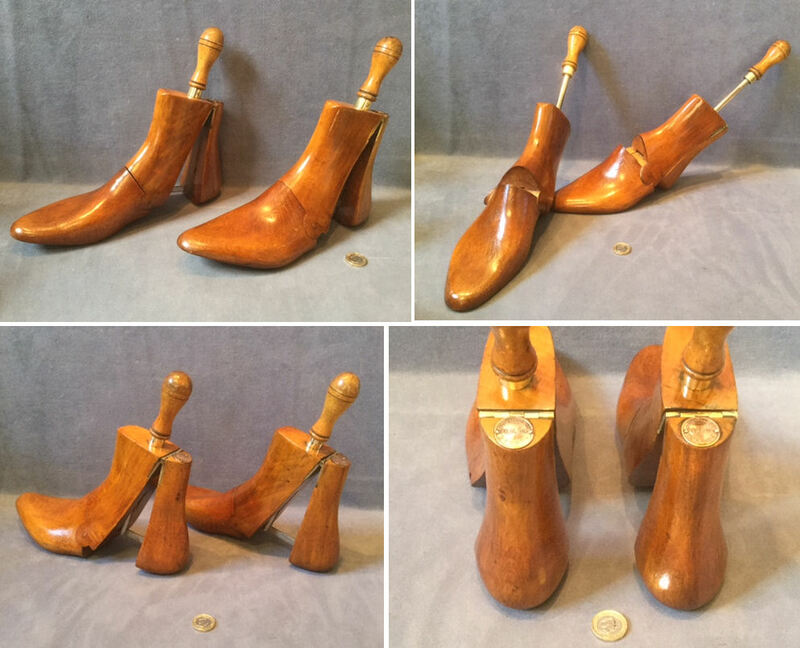 Original, quality pair of 19th century three piece wooden short boot trees in polished beech. Each tree has a hinged main foot piece, a heel section and a slide in central section to tighter each tree when inside the boot. Each tree has two engraved brass plaques one detailing the original owner "PC Tarbutt Esq" and the other "M. Wildsmith & Sons, makers 17 Jermyn St London SW". Each tree also has its sections marked according to left boot or right boot. 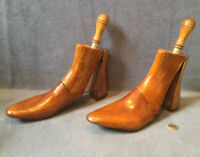 A super very usable pair of boot trees, size not indicated but complete and in good and working order. 9.75" tall x 10.5" long and 3.5" widest. 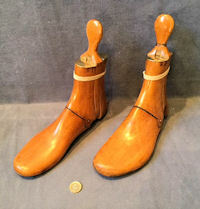 Pair of original, quality late 19th century short boot trees in beech with an extending heel action, a pivoting foot and brass fittings. Each tree has a circular embossed copper plaque for the retailer/manufacturer "Peal and Co 487 Oxford St". All has been cleaned and refinished, and the brass and copper has been polished and lacquered, although the lacquer may be removed at no extra cost. A super pair of boot tree, complete and in good and working order. Heel extended 11.5" x 3.5" and 9.5" tall. Heel in 11" x 11.5" tall. 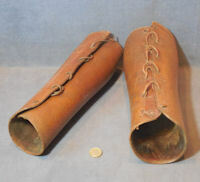 Pair of original, 1920's men's gamekeepers type of brown pigskin leather gaiters with the original leather thong laces. These good sized gaiters with the laces are complete and in good and usable condition. 12" tall at the back. 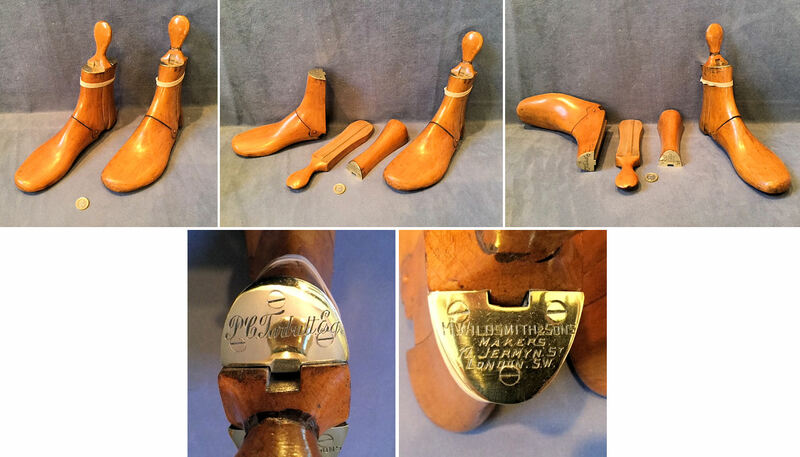 Original, quality 1920's folding boot jack in beech with brass fittings and an ivorine label for the manufacturer "Peal & Co. 487 Oxford St London, Hunting & Military Bootmakers". Three old wormholes, now well treated and complete and in good and working order. Open for use 11.5" x 4" x 2.5". Folded 11.5" x 2" x 2". 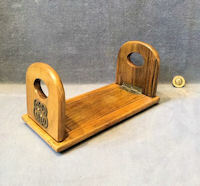 Original, quality circa 1900, smaller than average adjustable folding bookstand made in olivewood. This clean example, with no wear on the slide, has a three letter monogramme in brass on each upstand. A most unusual size. Complete and in good and working order. 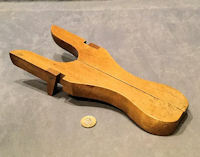 Folded flat for travelling 8" x 4" x 1", with ends up 4" tall and fully extended 12.5". 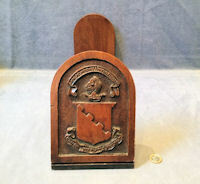 Original, quality late 19th cenutry carved walnut folding bookrack with coats of arms carved to each end plate. 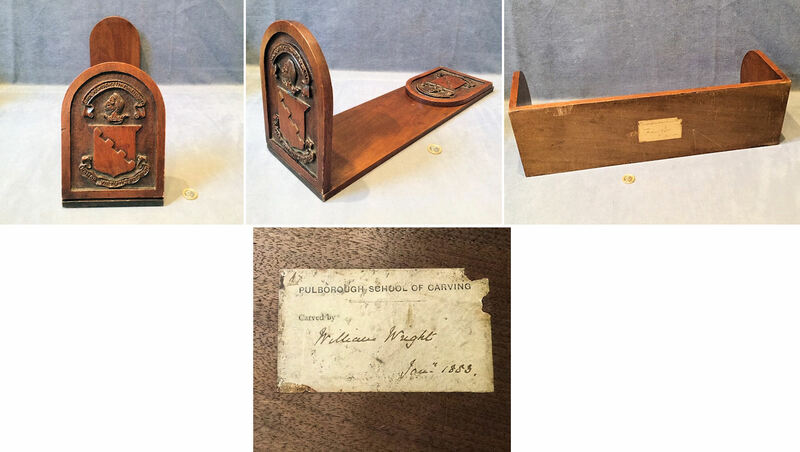 The underside has an old paper label detailing "Pulborough School of Carving" and "Carved by William Wright Jan 1883". Complete and in good and working order. Folded down 20" x 6" x 1" and 8.25" tall when up. 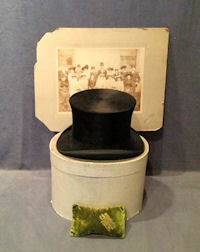 Original, quality late 19th century oval shaped hat tin with a hinged lid and the original scumbled paintwork to the exterior with green painted bands. The front has a hasp and eye to take a padlock and the top lid has a wire carry handle. Some surface damage to the paint on the lid otherwise all is complete and in good order. 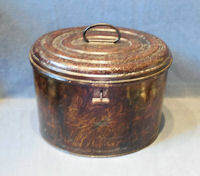 11" tall x 16" x 12"
Original, quality oval shaped hat tin circa 1900 in the original scrumbled paintwork with a loop handle to the hinged lid and a hasp fitting to the front to take a padlock. The interior has retained its orange paintwork and most of the original paper label detailing "Manufactured expressly for Ralgen Iron mongers of Newport". Some pitting to the top outer paint otherwise complete and in good and working order. 10.5" tall x 14" x 11". 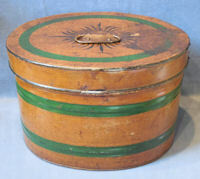 Original, quality, late 19th century, tin hat box in the shape of a travel trunk, with the original 'wood grain' finish paintwork. The interior shows little signs of use with the original red ochre paint. The brass hasp and lock have been polished and lacquered, although the lacquer may be removed at no extra cost. A replacement key has been cut to suit. 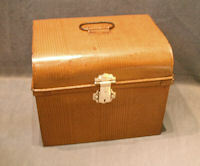 Some scuffs to the finish in places, but overall a very clean and unusual hat box, with a carry handle to the top. 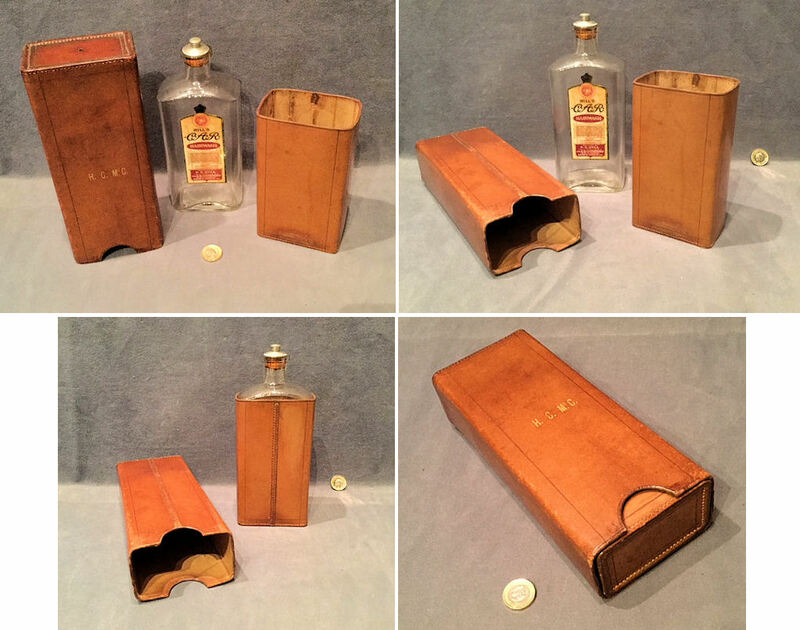 13.75" x 10.25" and 11.5" tall, with handle down. 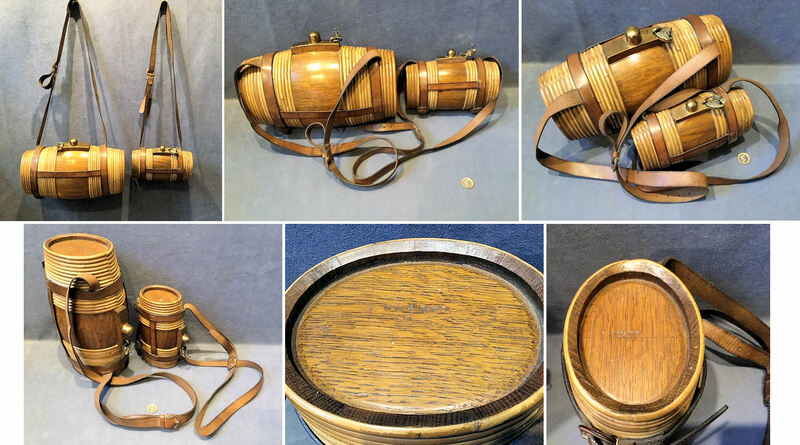 Original, quality, late 19th century, circular shaped military hat tin in the original bronzed and patterned paintwork andwith a wire carry handle to the hinged lid. The interior has most of its original bronzed finish. The front of the tin has a hasp fitting to take a padlock and the lid has a shield shaped brass nameplate for the supplier "Hawkes and Co Ltd 1 Savile Row London W". 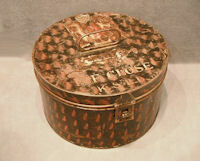 The lid has an owner's detail painted in white letters detailing "L.F Close K.S.L.I". Generally complete and in good shape, but with a few dents and rubbing to the paintwork. 11.75" diameter x 7" tall. 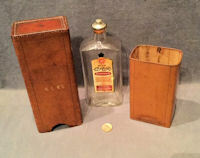 Original, quality late 19th century clear empty glass bottle of 'Hills Hairwash' prepared for "A.W Hansford Court Hairdresser, 48/49 St. James St, London S.W.I" in its custom made two piece stitched leather case. Is in superb condition, stamped and gilded for the previous owner H.C.Mc.C. and complete and in good order. Outer case 9.5" tall, 3.75" and 2.25". Original, quality pre-war rectangular shaped brown fibre travelling wardrobe type suitcase fitted with a rail to the top and a hanging ring to the outside top to enable the open case to hang on the wall or wardrobe interior permitting the garment to hang down freely. 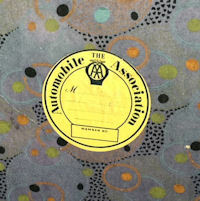 This item is in super condition inside and out with a decorated blue lining, polished aluminium catches to the outside and most interesting of all, it has the retained the circular paper label for the owner's details and the membership number of the 'AA' Automobile Association. Complete and in good order. 21.75" x 18.5" x 8". 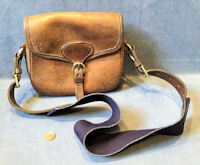 Original, 1920's small top quality brown leather Gladstone bag, with a brass locking catch, brass studs to the underside, double thick leather strap handles and a super clear pale leather lining with pockets to one side. The strap handles are stitched to the bag from one to the other underneath the base. The cleanest example we have had and showing very little sign of use. 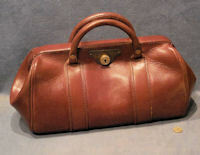 This bag lack the key but is otherwise complete and in superb order. 18" long x 8" wide and 10.5" tall including handles. 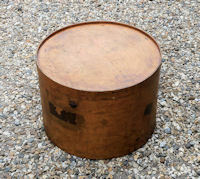 Original, quality 1920's circular bent plywood hat box with a lift off circular lid, all in the old lacquered finish. 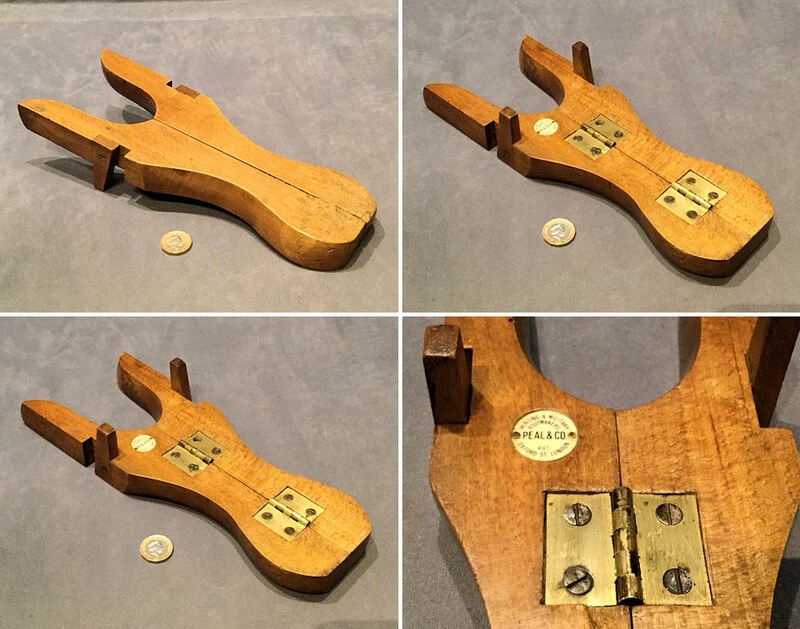 The original leather straps and handles are long gone although the various studs have remained, otherwise all is complete and in good order. 13" tall and 18" diameter. Original, quality sheet brass button stick, used when polishing brass buttons still fixed to the uniform this prevents staining the cloth. This example is stamped to the front with the patent number for the year 1917 and "W.H.B". Polished and lacquered, although the lacquer may be removed at no extra cost and complete and in good and working order. 6.75" x 2". Original, quality sheet brass button stick, used when polishing brass buttons still fixed to the uniform this prevents staining the cloth. This example is stamped to the front with the patent number for the year 1917. Polished and lacquered, although the lacquer may be removed at no extra cost and complete and in good and working order. 6.75" x 2". 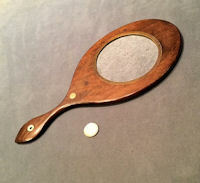 Original, quality late 18th / early 19th century oval shaped double sided hand mirror with a super delicate mahogany frame and backing, with each mirror mounted with several different coloured bentwoods. Both sides have two 'Mother of Pearl' inlaid button shaped discs and one mirror is a reducing type and the smaller is an enlarger. Complete and in good and working order. 13.25" x 6.25" and 0.5". 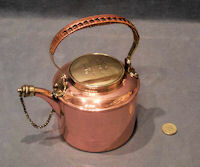 Original, quality 1920's copper picnic kettle from a picnic basket. 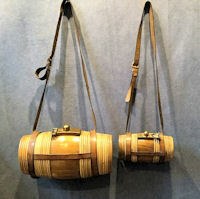 This super example has a folding top handle covered in woven straw, a large screw off brass lid detailed "Notice take care to unscrew both caps before lighting lamp", a screw off cover to the spout with a retaining chain and inside a lift out tea infuser. 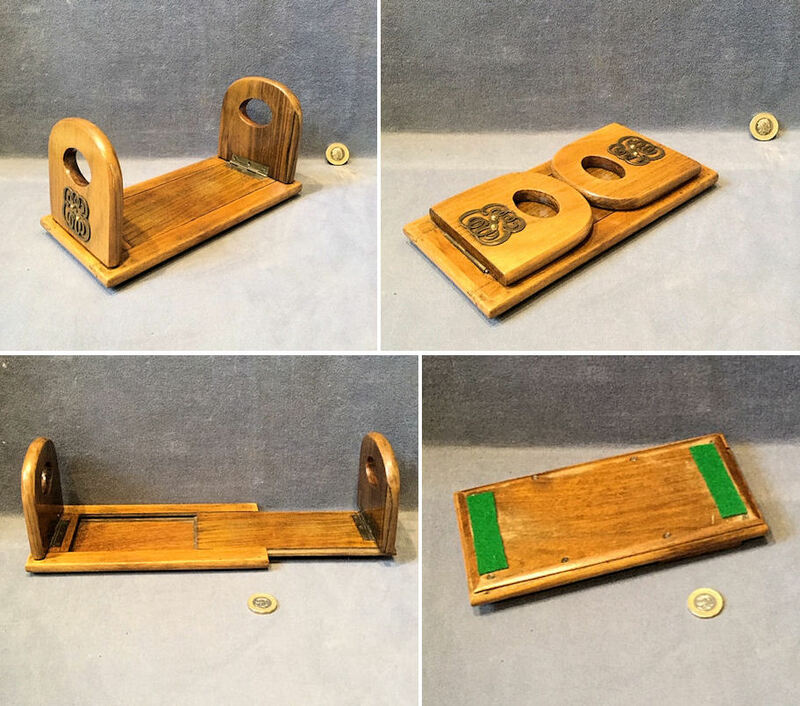 All has been polished and lacquered, although the lacquer may be removed at no extra cost and all is complete and in good and working order. 7" tall with handle up and 4.5" when down. 6.75" wide including spout and 4.5" base diam. Original, quality late 19th century pair of Sheffield steel open razors, with ivory side covers in the original fully fitted crocodile skin covered case. The outside of the box is marked in ink 'W.C.B' and the inside of the lid is detailed for " Holtfzapffel and Co London " the maker. Each blade is impressed Holtfzapttel and Co Haymarket, Sheffield Maker. All is perfect with not a chip or crack in sight, to either the blades or ivory side plates and perfect for use if required. Case 7" x 2.5" x 1" and razors closed 6.5" each. 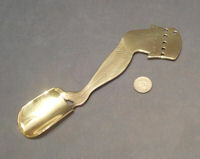 Original, quality 1920's / 30's small sheet brass shoe horn, detailed to one end "Wear K Shoes". All has been polished and lacquered, although the lacquer may be removed at no extra cost and is complete and in good order. 5.75" x 1.5" x 0.5". 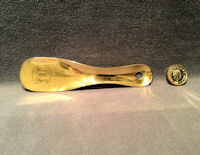 Original, quality superb sheet brass shoehorn circa 1900 in the form of a lady's leg circa 1900. 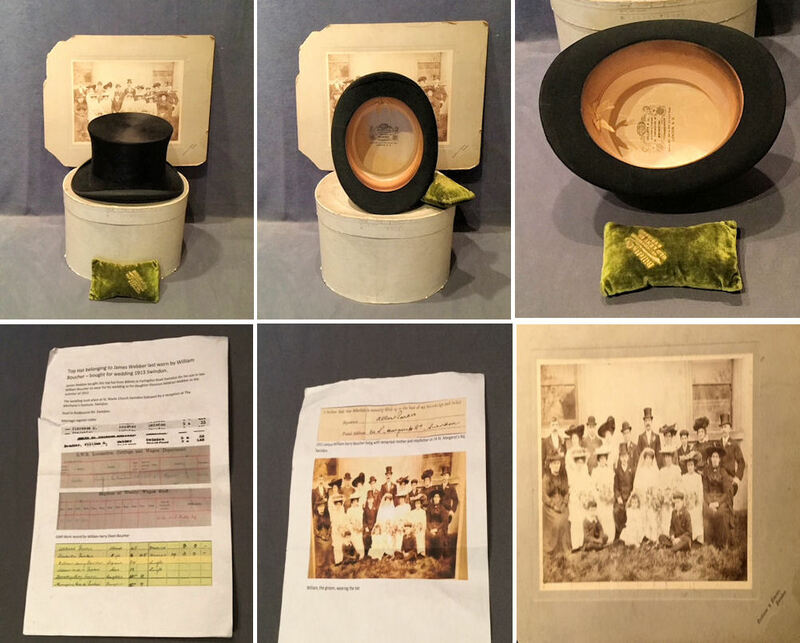 This example has scratch engraving of the shoe, garter and knickerbockers in good detail. All has been polished and lacquered, although the lacquer may be removed at no extra cost and complete and in good and working order. 7" x 2" x 0.25". 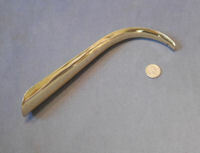 Original, quality 1920's, sheet brass gentleman's shoehorn of a good size and shape, with a hole to the top for hanging. Polished and lacquered, although the lacquer may be removed at no extra cost. Complete and in good and working order. 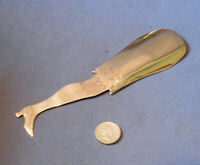 9.5" long x 2" widest. Price is for each.